Gor Mahia have lost 2-1 to USM Alger. And with Rayon Sports winning their tie against Yanga 1-0, Gor Mahia are out of the tournament. Jacque Tuyisenge scored Gor Mahia’s goal. 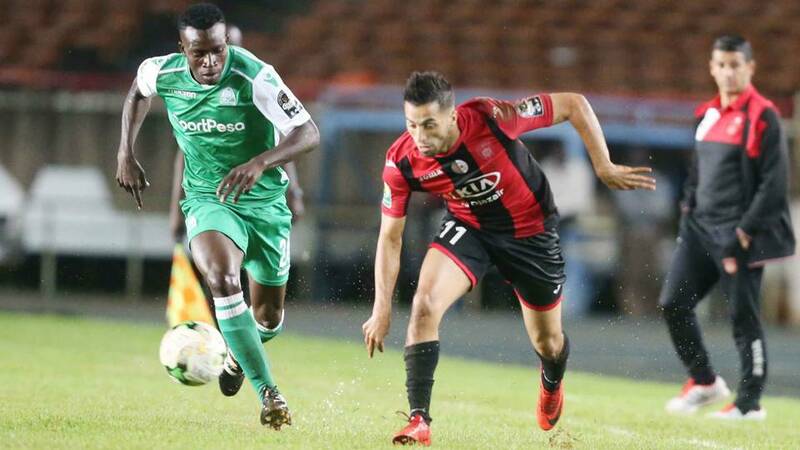 Gor Mahia on Wednesday failed in their bid to reach the quarter-finals of the Caf Confederation Cup after losing 2-1 away to USM Alger at the 5th July Stadium in Algiers, Algeria in their final preliminary match. Goals from Prince Ibara and Amis Sayoud propelled the hosts to victory as they finished top of group D with 11 points, with Rayon Sports grabbing second spot after a 1-0 win over Yanga at home to finish on nine points and seal the final quarter-final slot. The lanky Caleb Bimenyimana, who scored when Rayon beat Gor in Nairobi last week, netted the all-important goal in this match. K’Ogalo finished third in the pool with eight points and miss out on a last eight berth. Jacques Tuyisenge pulled a goal back for Gor but it proved to be too late as the Algerians held on for the win. 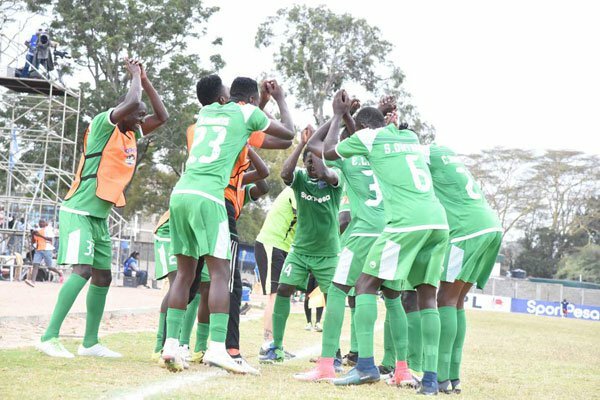 As expected, K’Ogalo began the match on the back foot in the wake of a myriad of attacking moves from the hosts and at some point had to thank reserve goalkeeper Fredrick Odhiambo for stopping a ninth-minute Ahmed Koudri penalty, which was awarded after Harun Shakava appeared to handle in the box. Ibara would, however, hand his side the lead on 36 minutes, after escaping his markers to power a header past a stranded Odhiambo from a corner kick. The Kenyan side also survived a scare towards the end of the half when Ernest Wendo was forced to clear a goal-bound shot off the line with Odhiambo well beaten. Backed by a noisy crowd at their backyard, Alger came back forcefully in the second half, and added the second goal against the run of play. As a result, Gor, who earned Sh27.5 million in prize money for making it to this stage of the competition, have missed an extra Sh8 million reserved for the eight teams which make it to the quarters. The tournament’s winning team will pocket Sh125 million. 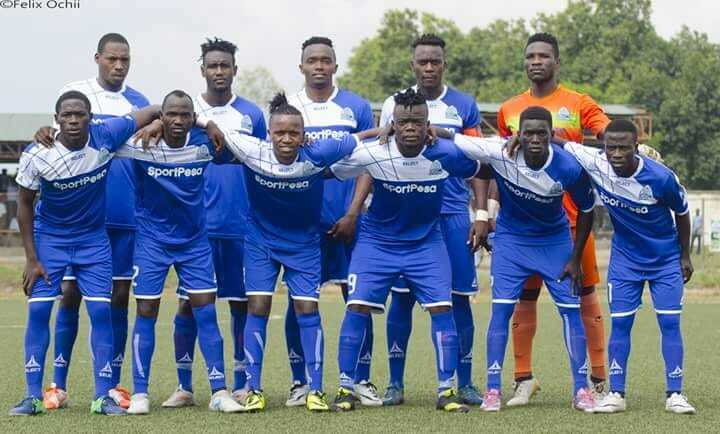 Gor, who clinched the 2018 Kenyan Premier League title with six matches to spare last weekend, will now turn their attentions to the FKF SportPesa Shield, where they take on Kariobangi Sharks at the Kenyatta stadium in Machakos on Saturday. Confidence was high as Gor Mahia left for Algeria on Monday. The team landed in Morocco at 2pm on Monday where they will spend the night before leaving for Algeria the next day. Kogalo was buoyed by their two successive wins over arch rivals AFC Leopards and a convincing 3-0 over Sofapaka. In the squad is Jacque Tuyisenge who has missed the last two matches with an injury. Left out of the squad is Ephrem Guikan who has yet to recover from his injury. Gor Mahia need a point to move to the next stage. This is within their reach considering that they played better than the Algerians when the two teams last met at Kasarani. This despite the fact that Kogalo were reduced to 10 men. USM Alger have also been unimpressive of late, drawing with Rayon Sport at home before losing to Young Africans. Gor Mahia travelling squad; Technical bench: 1. Dylan Kerr – Head coach, 2. Zedekiah Otieno – Asst coach and 3. Jolawi Obondo – Team Manager: Keepers:, 4. Bonface Oluoch- Keeper, 5. Fredrick Odhiambo- Defenders, 6. Haron Shakava- Defenders. 7. Joash Onyango- Defender 8. Wesley Onguso- Defender., 9. Karim Nzigyimana- Midfielders., 10. Ernest Wendo- Midfielder, 11. Humphrey Mieno- Midfielder., 12.Bernard Ondiek- Midfielder. 13. Lawrence Juma. Midfielder/ Striker, 14. Francis Kahata- Midfielder, 15. George Odhiambo- 16. Samuel Onyango- Striker, 17. Jacques Tuyisenge- Striker, 18. Francis Mustapha. Strikers: 19. Charles Momanyi- Defender, 20. Philemon Otieno- Defender/ Midfielder and 21. Lordvick Aduda – CEO. President Uhuru Kenyatta has come to the rescue of Gor Mahia who were in danger of missing their trip to Algeria for the crucial return leg of the 2018 CAF Confederations cup. On Friday, the president donated Ksh 6 million towards purchase or tickets for the Algiers trip. Gor Mahia need at least a point to qualify for the next stage. President Uhuru Kenyatta has come to the rescue of Gor Mahia after facilitating the team’s travel to Algeria for their continental assignment. Gor treasurer Sally Bolo on Friday confirmed that the head of state had bought air tickets for the team worth Sh6 million. She said the club’s management was stranded and wondering how to offset the Sh8 million expense to North Africa for the team’s last group match of the Caf Confederation Cup against USM Algers on Wednesday. “We wrote to the Ministry of Sports through Football Kenya Federation and they responded telling us they didn’t have the money,” said Bolo. 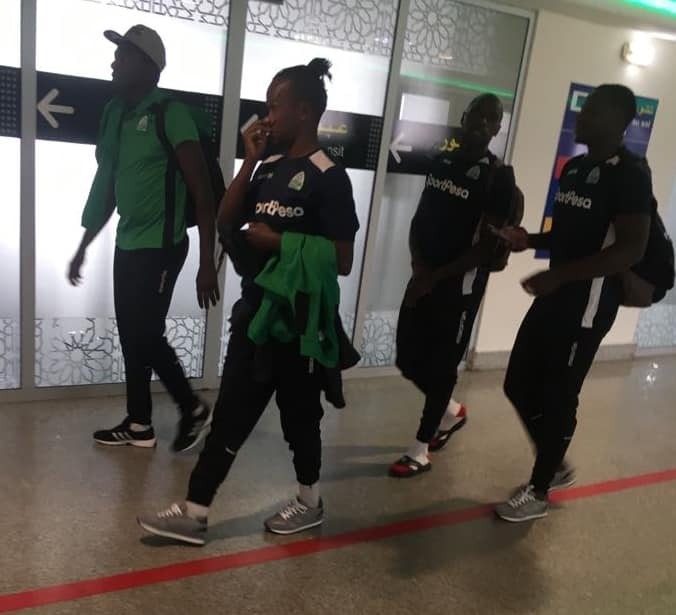 Thus, Gor are expected to depart for Algiers on Monday ahead of the clash in which Dylan Kerr’s team have to pick atleast a point to be assured of qualifying for the quarter-finals. Rwanda’s Rayon Sport will play host to Tanzania’s Young Africans in Kigali in the other group match which has great significance to the Kenyan champions. Gor Mahia are once again seeking assistance from the government in order to make their trip to Algiers. Last time Gor Mahia sought assistance to travel to Cape Town to play Supersport, sports minister Rashid Achesa flatly refused. Gor Mahia are not sure whether they will honour their final Group D match against USM Alger on August 29. Goal can reveal that the club is currently in need of Sh6.1m to make the trip to Algiers for the crunch match. However, the Kenyan government is yet to respond to the plea by Football Kenya Federation to purchase return tickets for the Kenyan champions. Goal have obtained a letter from FKF CEO Robert Muthomi dated August 7 and addressed to the Ministry of Sports PS Kirimi Kaberia requesting for purchase of tickets for the trip. “Football Kenya Federation wishes to inform you that Gor Mahia is scheduled to travel and honour a Caf Confederation Cup Group stage match against USM Alger in Algeria on August 29, 2018. “The team currently occupies the top of the table and will be a crunch match where a good result will mean the team qualifies for the quarter-finals. It has been close to thirty years since a Kenyan club qualified for the quarters of the Caf tournament and this milestone will bring a lot of national pride to the country. But when contacted, Gor Mahia CEO Omondi Aduda confirmed that they are yet to receive a confirmation note from the government on the same. “We have not received any response from the government in regards to the request from FKF and time is now running out. We want the team to leave on Monday and as things look, we might have problems travelling. “At the time the above letter was written the fare was Sh135, 000 (per ticket) and that was the cheapest flight (Turkish Airline) and now the same airline has risen to Sh156, 000 as of yesterday (Monday). Aduda added the visit of Rayon Sports and Gor Mahia’s recent away matches in Mombasa, Kisumu and Nakuru, had eaten to the club’s coffers. “We paid tickets for match officials from Angola and Zimbabwe for the Rayon match. People should know that we are not crying because we have money but because the money is already used. Coach Dylan Kerr says his side is determined to go for nothing short of a win when they play USM Alger. Kerr also sought to answer those who said his fielding was questionable. “Against Rayon Sports, I picked the best team to win and we didn’t win so now we have to keep the focus and go to USM and win,” he continued. Unlike in the Yanga match, Kerr said his goalkeeper was to blame for the second goal. 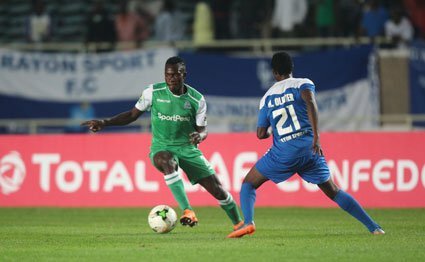 In the video above, Gor Mahia skipper Harun Shakava has appealed to both KPL and FKF to postpone one or both of their league matches against Sofapaka and AFC Leopards in order to give them more rest ahead of their crucial match away to USM Alger on Agust 29. “I think fatigue cost us. We had asked FKF and KPL to reschedule some of our matches and give us time to rest, but they denied us. We have played many matches in the last few weeks, yet we have two big matches (Sofapaka and AFC Leopards) this week before travelling to Algeria,” Shakava told Standard Sports. “Players like Tuyisenge (Jacques) were even forced to play with injuries.It is going to be tough in Algeria, but I cannot predict the result. In football anything is possible. We just need to cope up with the environment and tempo in Alger. “At the moment, all the players are down after our unbeaten home run ended abruptly, but we are big players and I’m confident we will bounce back strongly,” he added. However KPL Chair Oguda will likely respond by saying he has not received a formal request from the club. Midfielder Humphrey Mieno said Walusimbi’s absence was heavily felt on Sunday. But I think we still have quality players, who can fill that void,” said Mieno. Eric Rutanga who scored from a free-kick on Sunday, has expressed in interest in joining Gor Mahia. Rayon Sport left back Eric Rutanga has opened the door for a possible move to Kenyan champions Gor Mahia, a statement that would be music to K’Ogalo fans’ ears coming at a time when Ugandan Godfrey Walusimbi is edging closer to the exit. On Sunday night, Rutanga might have scored the goal that potentially puts Gor on the verge of exiting the CAF Confederations Cup and his celebration infront of the K’Ogalo faithful did not help matters much, but he might soon be their answer to left back problems. “If Gor Mahia want me, I can come. But, they have to talk to the club and pay the money required. I am ready to come here any day. Gor Mahia is a good team with good players and huge fan base. It would be great to come here,” Rutanga told Capital Sport on Sunday night. Rutanga still has one year to run on his Rayon contract and with the transfer window of both countries already closed, the two clubs might engage in talks for a possible move in January. Gor’s lack of a trusted left back was hugely exposed in their loss to rayon on Sunday with regular right back Philemon Otieno pushed to the left while Wellington Ochieng, yet to hit full match fitness after returning from injury started on the right. K’Ogalo were left with a void at left back after Walusimbi left in a huff to South Africa where he engaged in talks with Kaizer Chiefs. 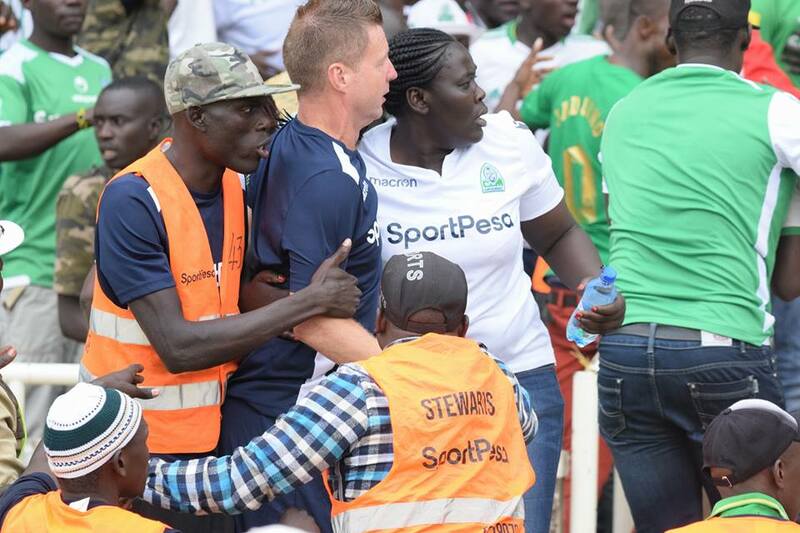 Gor boss Dylan Kerr says he feels betrayed by the player but maintains life will move on even if he is gone. “What he did was selfish. He left us without caring of the club, without caring of our league campaign, without caring about the Confederations Cup. It was selfish from him on his teammates and the club. He doesn’t care about the club; only the money,” an agitated Kerr said. But Rutanga’s arrival might spell some new lease of life to Gor especially with his performance against them on Sunday where he scored a sublime set piece. He also scored the equalizer when the two sides played in the first leg in Kigali. 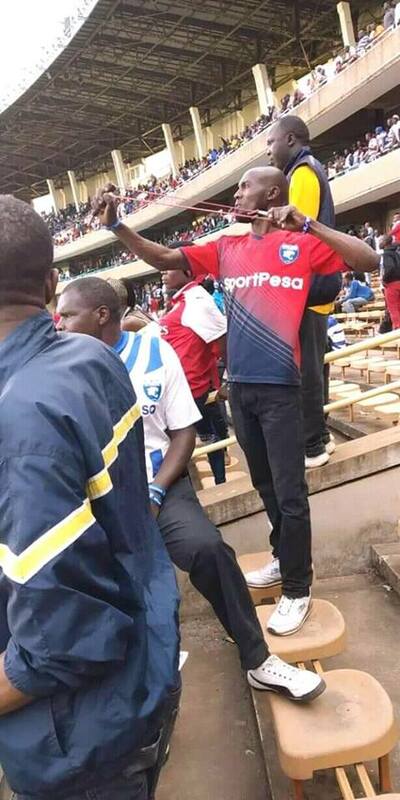 And his hope that both Gor and Rayon proceed into the Quarters of the Confederations Cup might even make him more loveable to the Gor faithful. “I am very happy that we came to Kenya and won. The focus now is on the final game against Yanga which we will treat as a final and I know we will win. I also pray for Gor to beat USM in Algeria so that we can go through to the quarters together,” the left back said. Rutanga has heaped praise on his teammates for their performance against Gor, saying they came in determined to go all out and get a win. “It was a blow for us to be here without four of our first team players but I am grateful we could win. We worked hard as a team and Gor too did not make it easy for us,” Rutanga further explained. 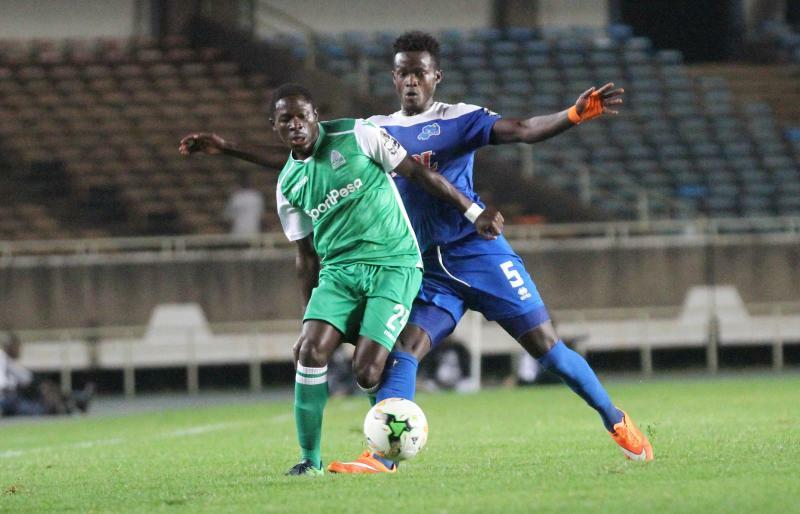 Gor Mahia were on Sunday stunned 2-1 by Rayon Sports in the CAF Confederations cup match. USM Alger were also stunned 2-1 by Yanga in Dar es Salaam. The group is now tight with three teams all with a chance to qualify. The match was bound to be a difficult one. Rayon sports proved their worth when they almost beat USM Alger in Algiers a month ago. Francis Mutafa equalized to make the score 1-1 at halftime. However Eric Rutanga’s free-kick gave the Rwandese side a win that kept them in contention. Bonfilscaleb Bimenyimana and Eric Rutanga’s goals on either side of Francis Mustafa’s equaliser gave the visitors a deserved win at a half-packed Kasarani Stadium. Gor, who face Algerian side USM Alger in the final group stage match in 10 days’ time, remain top of Group D on eight points, two ahead of the Rwandan champions who need a win in their last game against Tanzania’s Young Africans to stand a chance of going through. Rayon will be hoping the Algerians, who remain second on eight points after suffering a shock 2-1 loss to Yanga in Dar es Salaam on Sunday night, beat Gor Mahia in Algiers. “We came determined to win this match and we got everything right. We shall approach our last game like a final, play our hearts out and hope Gor doesn’t win away,” said left back Eric Rutanga after the game. Former Kenyan Prime Minister Raila Odinga, who is also the Gor Mahia patron, had not even settled on his seat at the VVIP stand before Bimenyimana swept the ball past Gor Mahia custodian Shaban Odhoji for the the opening goal barely two minutes after Zimbabwean referee Norman Matemera got the proceedings underway. Rutanga beat his marker down the left before delivering an inch-perfect cross that resulted into a wild celebration from the few Rayon fans on the opposite stand. Burundian forward Mustafa restored the buzzing atmosphere at the half-packed Kasarani stands with a 21st minute equaliser after dispossessing Rwatubyaye Abdul to slam a right-footed effort into the back of the net. Rutanga restored Rayon’s lead in the 54th minute with a well-curled free-kick from the left flank leaving Odhoji with no chance, just like he had scored in the two sides’ first leg tie in Kigali which ended 1-1 two months ago. George “Blackberry” Odhiambo had brought down speedy winger Kevin Muhire. 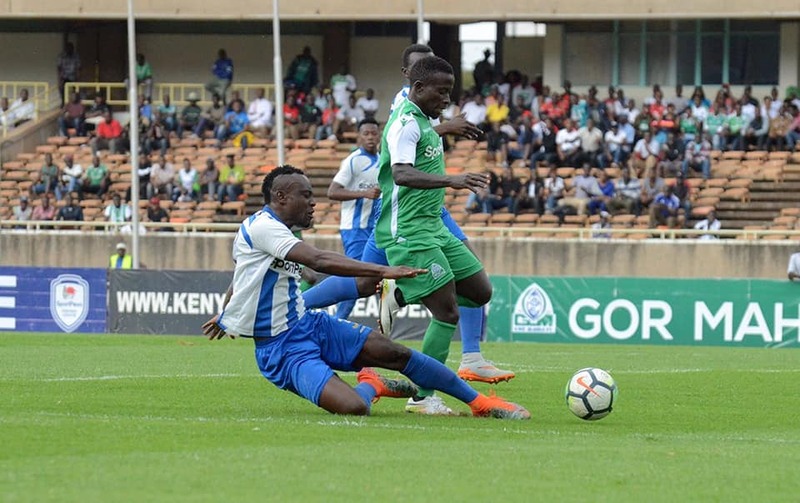 Bimenyimana had the ball in the back of the net with 15 minutes to go, but Matemera called for a foul on Odhoji before Gor missed a scoring chance on the other end after George Odhiambo failed to tuck away the ball from the six-yard box. Last minute efforts by the hosts to get an equaliser bore no fruit as the cash-strapped Rwandans, who travelled with a team of 15 players, broke into jubilation after the final whistle. 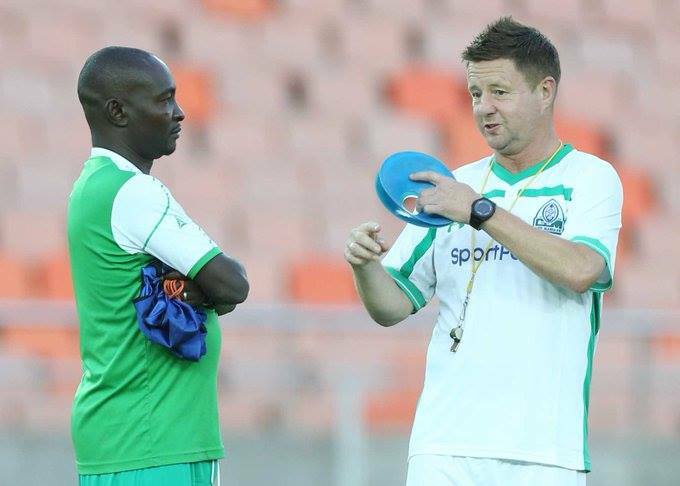 In the absence of Godfrey Walusimbi, who is on his way to South Africa’s Kaizer Chiefs, Gor coach Dylan Kerr lined up Philemon Otieno on the left as Wellington Ochieng’ took charge of the right back position with Jacques Tuyisenge and Mustafa leading the onslaught.